We built our first tillers back in 1937. 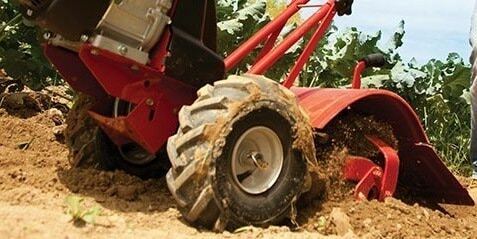 Today, they feature rugged and durable features like cast-iron encased transmissions with bronze gear drives and our patented Bolo® tines to turn your dirt into fertile soil. There are several factors that will help you decide which garden tiller best fits your needs. Finding the right tiller depends on your soil type, the size of your garden, garden layout and whether you are working existing garden beds or starting new ones. 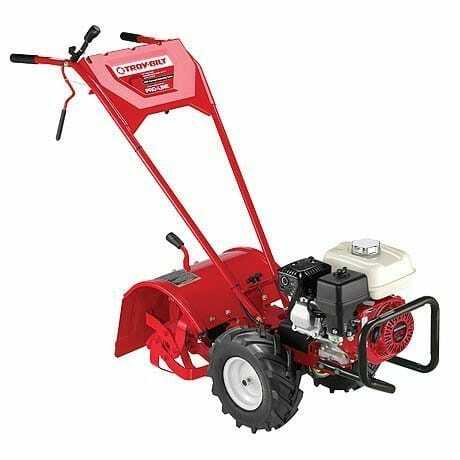 Rear-tine tillers are ideal for creating new, large gardens up to 10,000 square feet in size. 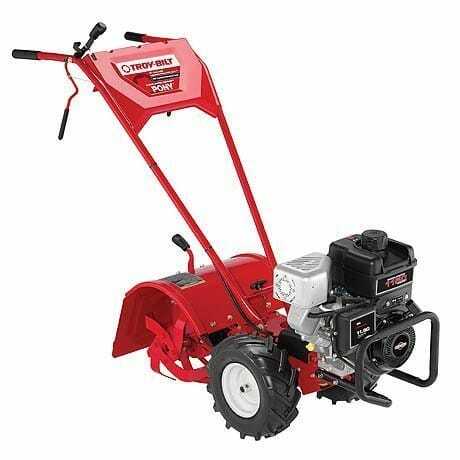 Front-tine tillers are better for maintaining gardens that are less than 5,000 square feet. The Bronco™ Axis™ vertical-tine tiller creates the smoothest, fastest tilling experience. It features vertical tines that work together like a giant eggbeater, spinning in opposite directions to instantly drill down, then till forward through the dirt at their full depth. This forward motion minimizes vibrations and fatigue. And with Just One Hand® operation, you can walk on solid ground, not your freshly tilled soil. Our Pony rear-tine rototiller with its dependable engine, tough cast-iron transmission and forward-rotating Bolo tines are just a few of the reasons that the Pony will power through your tilling and soil preparation chores for many seasons to come. Troy-Bilt’s Pony ES electric start rear-tine rototiller has a 250cc* Briggs & Stratton® engine, a 12-inch tine diameter and a 16″ tilling width. 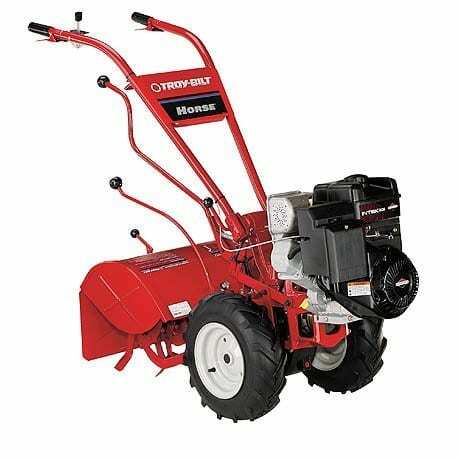 The Pony ES will power through your tilling and soil preparation chores for many seasons to come. Troy-Bilt’s Pro-Line FRT rear-tine rototiller works like a pro because it’s designed for your large scale or commercial groundbreaking applications. A professional strength, mid-size tiller, the Pro-Line FRT offers unmatched durability and performance in gardens up to 1,500 square feet. To bring those ideas in your head to life, you need a tiller that works like this Horse. The Horse garden tiller can do all your heavy duty garden chores, including groundbreaking in new beds or premium soil preparation in existing ones. 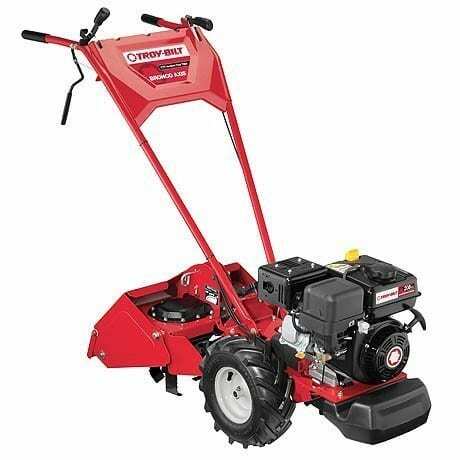 Wenger Equipment LLC is your local Troy-Bilt dealer for the Central WI. At Wenger Equipment we are committed to treating our customers the way we would want to be treated. We carry only high quality equipment from reputable manufactures in order to give you a great value for your investment. Our goal is to help you select the equipment that will best fit your needs and keep that equipment running for years of dependable service. We have over 32 years of experience serving thousands of satisfied customers in the Central WI area. As an added benefit, when you purchase a new piece of equipment from us you’ll also get a $10 per hour discount off of our posted shop labor rate for all service and repairs for the life of the machine. Its just one way we say “thank you” to our valued customers.